“The historical record with respect to the successful advancement of new management systems is poor. This book has highlighted and analyzed the deeper reasons why executives do not rush to a new management system despite its obvious financial, non-financial, and human benefits. This should give the leaders of the Lean management movement much to think about in terms of the strategies and tactics they have used to advance Lean management. 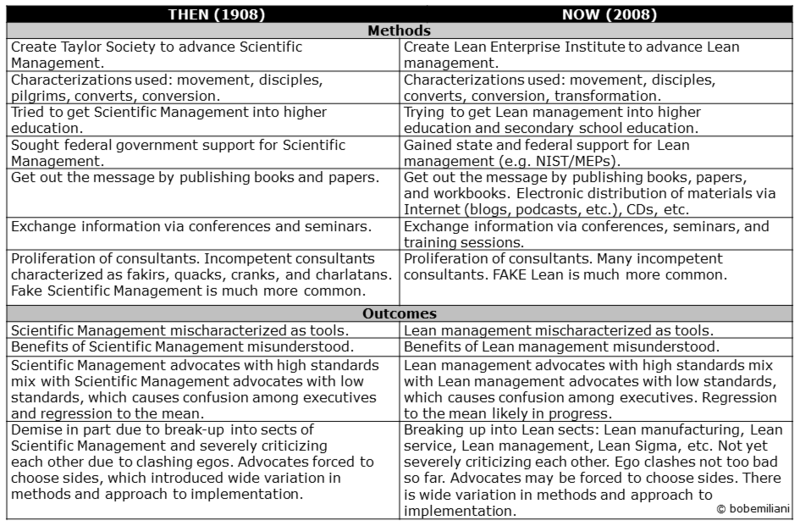 Figure 7-1 summarizes some of the similarities and differences in how the Scientific Management community tried to advance their management system compared to how the Lean management community is trying to advance its management system, as well as some outcomes… the strategies and tactics in use today are largely the same as those used by Scientific Management system advocates in the early 1900s. Yes, there are some important differences, but it is difficult to say if any will initiate a tipping point for Lean management or if they will be inconsequential. We always have to worry about flavor-of-the-month hungry executives, fixated on the short-term and addicted to shortcuts. Consultants will take advantage of these enduring weaknesses to sell executives the next new thing… The marketplace will always produce customers who want inferior, low-fidelity versions of Lean management. And the marketplace will always produce consultants who will gladly respond to that customer’s pull and seek to satisfy their demand. Nothing can be done about that. The last paragraph is key in that t re-frames Lean – REAL Lean (not Fake Lean or Lean sigma) – as a more ethical management system (see REAL LEAN: Learning the Craft of Lean Management (Volume 4), Chapter 9, “The Ethical Management System”). We have our work cut out for us. If we are at peak Lean, we need to be imaginative and creative to help Lean survive and avoid the fate of Scientific Management where only certain elements of it (i.e. tools) were subsumed into conventional, zero-sum management practice. The same thing is happening to Lean, as companies cherry-pick tools such as value stream maps, 5S, and standard work. Thank you for that good comparison. You might want to add “Denounced by labour unions as a method to press the most profit out of workers” on the outcomes section. While for (real) lean I’m sure it is really a denunciation, I’m not deep enough into scientific management (aka “Taylorism”) to make a judgement. Thinking about “peak lean” reminded me of the Gartner Hype Cycle – will there be a plateau of productivity after the through of disillusionment? Indeed, I should have included the union reaction to progressive management “Then” and “Now” in the figure, above. I think Peak Lean is a relevant observation at this time because for many years most people have misunderstood and misapplied Lean management (Fake Lean), so the benefits achieved will be small and disappointment in Lean is sure to follow. That outcome will eventually lead managers to seek new solutions to the same old problems. They will drift away from Lean and seek out new tools and methods.